On the 16th of March, 1962, a Lockheed Super Constellation airliner disappeared over the Pacific. 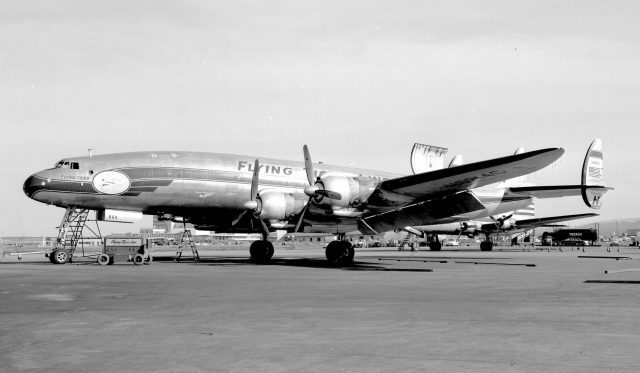 The Flying Tiger Line was the first scheduled cargo airline in the US. It was named after the Flying Tigers fighter unit, a World War II group of pilots from the US Army, Navy and Marine Corps whose shark-faced fighter jets became an iconic symbol of World War II combat aircraft. The Flying Tiger Line started after the war, with ten former Flying Tiger pilots, flying freighters they purchased as war surplus from the US Navy. The pilots and two ground crew provided half of the initial investment; oil tycoon Samuel B. Mosher funded the rest. They offered cargo services throughout the US and carried supplies across the Pacific to US Troops during the occupation of Japan. Two decades later, Flying Tiger Line flight 739 was a charter flight operated by Flying Tiger Line on behalf of the Military Air Transport Service. The aircraft was Lockheed model 1049H registered as 6921C. The Lockheed Super Constellation transport airliner required four crew and could carry 47-106 passengers. Flight 739 was scheduled with two flight crews (Captain, First Officer, Second Officer, two Flight Engineers and two Navigators), four cabin crew and 96 passengers for a flight from Travis Air Force Base in California to Saigon in South Vietnam, with refuelling stops in Honolulu, Wake Island, Guam, and the Philippines. Ninety-three of the passengers were jungle-trained Army Rangers, primarily highly trained electronics and communications specialists. The other three were members of the armed forces of Vietnam. The flight crew, five men and four women, were all civilians. The cargo consisted only of passenger baggage: personal articles and clothing. The flight departed Travis Air Force Base at 05:45 GMT on the 14th of March 1962 and proceeded normally for the next twelve hours, arriving in Honolulu at 17:44 GMT. All times are given in GMT except where otherwise noted. The aircraft went through minor maintenance. No issues of concern were found. The departure flight was delayed by half an hour after the cabin crew raised concerns about the crew rest facilities on the aircraft. The issues were resolved and the flight departed Honolulu at 20:40. The next leg proceeded normally and flight 739 arrived at Wake Island at 03:54 on the 15th of March. Again, minor maintenance was required. The aircraft was serviced, the four cabin crew were replaced, and the flight departed for Guam at 05:15. This leg was six hours and the flight arrived in Guam at 11:14. At Guam, the aircraft was serviced and refuelled. No maintenance was required. The next leg, to Clark Air Force Base in the Philippines, was estimated at six hours and nineteen minutes. The aircraft held enough fuel for nine hours and thirty minutes of flight. The aircraft departed Guam at 12:57. Guam Air Route Traffic Control Centre established radar contact soon after take-off. The flight crew then contacted Guam International Flight Service Station to request that their departure message was relayed to the Flying Tiger Line offices. At 13:25, the flight crew contacted Guam International Flight Service Station again to request a change in cruising altitude from 10,000 feet to 18,000 feet. No reason was given for the request and the flight crew were advised to contact Guam Centre. Guam Centre approved the request. At 13:28 the flight crew reported climbing through 11,000 feet. Guam Centre advised the flight that it was 100 miles west of Guam and that radar services were being terminated. At 13:33 the flight crew reported to Guam International Flight Service Station that they were 100 miles out and cruising at 18,000 feet. The last transmission from the aircraft took place at 14:22. The flight crew contacted Guam International Flight Service Station and reported cruising over the clouds (“on top”) at 18,000 feet, along with their position from 14:16 and their current estimated position. They expected to arrive at Clark Air Force Base at 19:16 and said that they had 8 hours and 12 minutes of fuel remaining. All of the radio calls were completely routine: there was no indication of any problem or difficulties. A little over an hour later, Guam International Flight Service Station suffered heavy radio static while speaking to another flight en route to Okinawa. At 15:39, the operator attempted to contact flight 739 in order to receive the now-overdue 15:30 position report. He was unable to establish radio contact. At 16:00, Guam Centre declared the flight to be in an uncertainty phase (INCERFA) in line with Oceanic Emergency Procedures. This means that there is concern about the safety of an aircraft or its occupants. At 16:33, after attempts to contact the aircraft had failed for over an hour, the status was upgraded to alert phase (ALERFA). This means that there is apprehension about the safety of an aircraft and its occupants. The distress phase (DETRESFA) was initiated at 19:33 after continuous attempts to contact the aircraft by all stations and aircraft in the area had failed. The distress phase means that there is reasonable certainty that the aircraft and its occupants are threatened by grave and imminent danger, including lack of contact and the risk of fuel exhaustion. Search and Rescue operations were initiated from Guam and the Philippines. At 22:27, by which the time the aircraft would have exhausted all of its fuel, Tiger Flying Lines flight 739 and all of its occupants were declared lost. The fate of the aircraft was unknown but then a call came in from a super tanker at 21:05, while the search and rescue operations were in progress. The shipboard lookouts had seen a mid-air explosion at 15:30 (1:30am local time). The crew said that the night was moonlit and clear, with a quarter of the sky covered by small cumulus clouds, evenly distributed. They first noticed a vapour trail or something similar overhead and slightly to the north of the tanker, moving in an east-to-west direction. At the time, the tanker was cruising on a heading of 077 degrees. The vapour trail passed behind a cloud and then there was an “intensely luminous” explosion consisting of a white nucleus surrounded by a reddish-orange periphery with radial lines of reddish-orange light. The explosion consisted of two pulses, lasting two to three seconds. The crew believed they saw two flaming objects of unequal brightness and size fall, at disparate speeds, into the sea. As they fell, a crew member noticed a small bright target on the ship’s radar, bearing 270 degrees at a range of 17 miles. The captain arrived on deck to see the fall of the slower object before it disappeared into the sea. He estimated its position in reference to a star and ordered the ship’s course reversed. 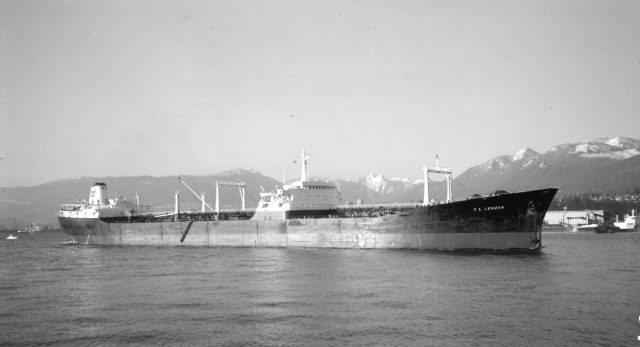 They aligned the heading of the vessel with the star and the captain found that the tanker’s heading was now 270 degrees, the same as the bearing of the target seen on radar. The tanker continued to the position of the radar target but found nothing there. They searched the area for 5½ hours but found no trace of wreckage or debris. The crew were unable to establish contact with the US Navy radio stations at Manila and Guam and eventually decided that the explosion must have been some kind of military or naval exercise. The tanker broke off the search and resumed her course. The approximate location of the mid-air explosion was confirmed to coincide with the estimated position of the aircraft at that time. The subsequent search was cited at the time as one of the most extensive ever conducted. No trace of the aircraft or the occupants was ever found. No explanation was ever found either. Investigators found that although the aircraft was properly certificated and was in airworthy condition, a few weeks earlier, it had exhibited significant power loss to one of its engines after 3½ hours of flight which had not been explained but after minor maintenance, it appeared to be in good repair. There was no sign that day that there were any mechanical issues with the flight. As a result, many believed that the aircraft may have been sabotaged. The investigation found that the flight line and ramp areas at Honolulu, Wake Island and Guam were not secure and anyone could enter and access non-military aircraft parked at the airfields. Specifically at Guam, the last stop, the aircraft was left unattended in a dimly lit area for some time. The explosion, as witnessed by the tanker, happened at the point when flight 739 should have been radioing in for the next position report. This seems extremely coincidental and is one of the reasons why many believe that the aircraft may have been sabotaged. In addition, a second Flying Tiger Line flight was destroyed. An identical Lockheed Super Constellation, said to have been carrying secret military cargo, also departed Travis Air Force Base on the same day and encountered difficulties several hours later. The pilot appeared to encounter issues on the instrument approach and crashed short of the runway. The main landing gear was torn off and then the aircraft caught fire; six crew members received minor injuries and one was trapped in the cockpit and died in the fire. Flying Tiger Line stated at the time that sabotage of one or both planes or a kidnapping of flight 739 were possibilities but they had no evidence to back up these theories. The executive vice president told the media that is was impossible for an explosion to occur on the Super Constellation in the course of normal operation: something violent must have happened. The Civil Aeronautics Board believes that the crew members of the tanker most likely witnessed the explosion of the aircraft. However, they concluded, as no portion of the aircraft was ever recovered, it was impossible to determine whether mechanical/structural failure or sabotage caused the loss of the aircraft. The original accident report has been scanned and put online as a PDF. Whatever happened must have happened quickly, as the crew never had a chance to alert anyone that there was an emergency. As no one has ever taken responsibility for sabotaging the aircraft and the wreckage is unlikely to be recovered, this is a mystery that may remain forever unsolved. Sadly, mysteries of this nature, after so many years, are indeed not likely to ever be solved. Guesses at the time included cargo, not or improperly manifested dangerous goods, perhaps of a military nature. The Flying Tiger Line, in the mid 1980’s, ceased to exist and was absorbed into FedEx. A humourous story about ordnance sent by air: During the civil war in Nigeria in 1967 I was a young flight operations dispatcher working for a company called Pan African Airlines of Nigeria. They operated a fleet of cargo aircraft, including a DC6A and a few DC4. The DC4 were brought in to fly humanitarian missions, bringing Red Cross relief goods to the front zone. But the army requisitioned them for the transport of war material. This was of course totally unacceptable: to have aircraft with the Red Cross on the tail flying arms and ammunition so the aircraft were grounded. The solution was soon found: During the day the DC4 would fly for the Red Cross, after the last flight a man with a bucket of quick drying white paint and a broom would erase the red crosses whilst mechanics would prepare the aircraft for the night shift with military cargo. In the morning, the same man, now with a bucket of red paint, would put the red cross back on the tailfin. This went on for a while until I had to come to the chief pilot’s office. There had been complaints about my loading schedule and I was given an official reprimand for failing to properly oversee the loading. Perhaps it would not be all that surprising, given that I was on duty early in the morning, did a half day shift, took a few hours rest, came back for the evening shift, took rest again and did the early morning. Six days per week, so it was suspected that I had perhaps been too tired. But the real reason was not any wrongdoing from my side: The paint that accumulated on the fin started to have a negative effect on the weight-and-balance, and perhaps the aerodynamics as well. So the procedure had to be modified. There were no flights on Sundays, so the fin was stripped of all excess paint on regular intervals. After that, there were no more complaints about the aircraft being wrongly loaded and being tail-heavy. Sometimes the cargo consisted of bombs or grenades. The fuses were removed for safety reasons and packed separately. One day there was a bit of a panic: The fuse of one bomb had not arrived. It was found and shipped on the next flight. This caused an even greater panic: the captain was nearly arrested. Reason: On the previous flight a fuse was missing, on the next he was short a bomb. The sergeant who had been in charge when they offloaded the first batch had to be recalled, numbers checked and with a few red faces (although, I am not sure if Africans do get red in the face) and an apology the captain was sent on his way. Of course, these stories do not shed any light on what happened to the Flying Tiger Super Connie. Rudy, have you ever considered writing your memoirs? I think you could get a pretty good book out of all the interesting experiences you’ve had in aviation. I don’t think that the timing of the explosion in relation to the next scheduled radio call is relevant, as there wouldn’t be any advantage to a saboteur in preparing a bomb to go off at precisely that moment. As long as it detonated at high altitude when the aircraft was far away from any help that would be enough. There might possibly be a connection if there was an electrical problem that was related to the use of the radio. The fact that Guam IFSS reported heavy static on the radio and that the explosion happened while the aircraft was hidden by cloud, as seen from the ground, does raise the possibility of a lightning strike. But as you say we’ll probably never know. Even if the wreckage is ever found it probably wouldn’t be possible to tell exactly what happened from whatever scattered and corroded pieces still remain. It’s also possible that the military or intelligence agencies did have evidence of sabotage but chose not to reveal it. They would not gain anything from publicly admitting to a major lapse in security and if the crash was arranged by a foreign intelligence agency they would also keep silent about their activities. It’s also possible that the executives of Flying Tiger Line emphasised the possibility of sabotage to deflect attention away from the company. When an operator has two fatal accidents with the same type of aircraft in a short period of time the normal suspicion is that there is something wrong with their crew training, maintenance or operational procedures. I can’t comment with any technical knowledge of FTL flight 739, but I just had to say the Super Connies have to be one of the most beautiful flying machines of all time. I don’t know how they handled, but if it’s true that if it looks right, it will fly right, they must of been dreams to fly. Not sure if the on board engineers would of agreed with four of those engines powering her. Thanks for a great site Silvia. Lightning strike very rarely causes an aircraft to explode in midair. My own, most dramatic experience was when the Cessna 310 I was flying was hit by lightning. I could see the impact on the left propeller, my passengers saw it exit at the right wingtip. Which also happened to be a main fuel tank. We could see scorch marks in the exterior paint. On landing the aircraft was inspected and a small, neat round hole, approx. 3 mm wide, was discovered in the side of the tank. Yet, there was no fire, no explosion. The aircraft at the time was registered PH-STR, later it was sold to the USA as N444ST. I don’t know if it still is around, but if so may well still be flying with a rivet in that tank. Lightning strike? Not impossible but also not very probable. Your second theory is interesting, still the possibility of not declared military cargo cannot be discounted either. The dangerous goods procedures have been much refined since I worked in Africa, everything was covered by a “general declaration” and there were no NOTOCs to tell the captain what he was carrying. 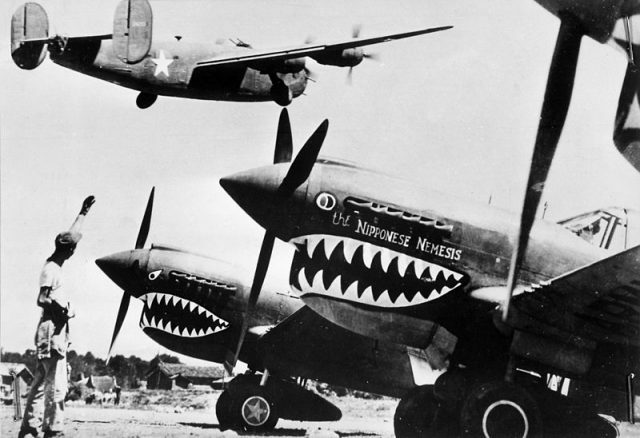 My understanding of the sharks mouth motif is that it was actually first used by the British in North Africa and the Flying Tigers emulated them. Huh, that’s interesting. I’ll see if I can find out. My uncle was a member of the Army personnel on this flight. My family is trying to find out any information and are in contact with a US Senator from our state. Forever Loved and Missed Sp4 Donald Albert Sargent. After just reading this again, February 2017, I realize that i never noticed an error: Sylvia talks about “Shark-faced fighter JETS. They did not fly jets then, their aircraft were Curtiss P40 and they had PROPELLERS. My father, Melvin L. Hatt, from Lansing, Michigan was on that flight. U.S. Army Ranger Special Forces. He left behind a wife, my younger sister, and I. Our mother suffered an emotional collapse, never to recover. We were adopted by family and raised in Michigan. Sorry to hear about your dad. I flew Navy aircrew on C-118 B transports in this area. I was kind of curious about the 12 hour flight time from Travis to Honolulu. VR21 NAS Barber’s Point Hawaii was my squadron base. We flew from Alameda NAS to NAS BP 8.5 to 9.5 hours. Alamed NAS was just south of Travis. I cannot see 12 hours unless there was a DEVIATION in flight plan. An unrecorded DEVIATION.Those other flight times from Honolulu to Wake, to Guam, to Clarke seem okay,depending on head, or tail winds. I have flown this exact flight path. A Super Connie exploding in mid-air as reported is something odd, too. They were not known to have fuel cell problems, or electrical problems near fuel cells.A single engine EVENT of this magnitude would not cause this in 99.8% of engine failures. I know of one C-118 engine incident and it was contained in flight. I smell AN INTEL OPERATION. Flying Tigers was rumored to be a COMPANY operation for US Military. My father, Sgt John A Karibo, from Bellefontaine, Ohio was also on this flight. He was a US Army Special Forces Ranger trained in biological, chemical and radiological warfare and going to Saigon, Vietnam to train (?) The government has refused to acknowledge the existence of this flight and the military servicemen onboard. These U.S Service men deserve to be honored for their Service and Ultimate Sacrifice for Our Country. We are trying to get their names on the Vietnam Memorial Wall in Washington D.C. but have been denied because the flight did not fit the criteria for inclusion. They Paid the Ultimate Price for Their Country – We will Never Forget These Heroes! Hopefully one day we will have answers to their disappearance. My brother SFC Nick C. Nichols Jr was on this flight. My grandfather, Harold Lamonde Curry, was one of the army personnel on this flight. I wasnt born yet but I honor him and wish something will eventually be recovered! from Tigers disappeaerd up in the Aluetian Islands THE SAME DAY! of rangers & CIA personnel who had been killed in- theater in Vietnan. This remained a state secret for years. I swear on my mother’s memory that this is a factual account. As a ‘Monday Morning Quarterback’ it seems the tanker which saw the airborne explosion at 1:30 AM local, and investigated for 5 1/2 hours, may have left area too soon. Seems like any debris would have been easier to spot in daylight hours. Tanker appears to have departed shortly after sun rise. I was supposed to go to Lackland AFB for training as a dog handler. a number of other men from my MP training class at Ft. Gordon did go but I was recruited into the Army Security Agency and my orders for Lackland were changed. Upon arriving at Ft. Dix a week late because of an accident I was in while home on leave I saw another member of my training company who was going to the same place I was overseas. He asked if I had heard about the guys who went to dog school and told me they had been on flight 739 headed to Nam and that our field first sergeant was on the plane too. He also mentioned that the other Flying Tigers flight had been carrying the dogs and had crashed in the Aleutians.. Never heard anymore but found other cargo manifests that list more than just Special Forces men, including other GIs and some Veit Nam soldiers as well. Had I not been recruited into the ASA I guess I would have been on Flight 739 too? 3511 35th street in Long Island City, New York along with Sgt James Twitty and Sgt Lucius Croft. I was in line in the mess hall that was directly across the street from the studio when Sgt Croft asked me “why aren’t you in the dispensary getting your shots?” I said “shots for what.” He said “you are going with us to Vietnam as assistant cameraman.” Sgt Twitty was going as Director, Sgt Croft as cameraman and I supposedly as assistant cameraman. My MOS was 841.20 Combat Motion Picture Cameraman recently. graduated from motion picture school at Ft. Monmouth, NJ. I was working in the instrumentation division assigned to a special project providing photographic support for the development and testing of the Nike Hercules Missile system running missions on the east coast and White Sands range near Ft Bliss in El Paso, Texas. Apparently I was put on orders to replace one of our soldiers that disgraced our unit at Ft Bliss and before orders to go to Vietnam were cut so I went to El Paso instead of Vietnam. I am trying to do what I can to have all of the names of the soldiers on flight 739 added to the Memorial Wall for soldiers lost to the Vietnam war. Sgt Croft had a daughter that was 6 years old when he was lost and my heart goes out to her and all of the families that lost loved ones. Neil Mengel M.S,T, Jacksonville Florida. still working in the Duval County Public Schools as a technician working on instructional equipment. May God Bless all of the families. nemengel@yahoo.com. I was notified of this posting today: Nov 11, 2018 by another surviving loved-one, Mark Johnston. It’s how we communicated that keeps us together in our plight to find the truth. Most of us have fought the same battles in Wash DC through the years getting to know brick WALLs instead of a black granite one. We have an honest plight, a truthful mission and the love we still have for our “disappearing loved-ones,” will NEVER fade. It is a grave injustice to throw this story under a granite rug, while in the meantime our loved-ones are DENIED HONOR, PEACE & LIBERTY on the WALL! Think about that Senators, Congressmen and President’s whom we’ve contacted over the years. They we’re all building that brick WALL that kept us out & in limbo – on purpose. There’s one story that I’ve heard only once, & I can’t believe that no one has taken it as seriously as I have. Right before our plane N6921C/Flight 739 left on it’s Air Force Contracted Mission, Kruschiev launched Sputnik; and to prove that it “could hit a target anywhere in the world,” he also launched one of the first ICBM’s. Yes folks a real possibility! It would explain the nuclear bright light! To tell the world this would devaste the political realm, including JFK. Think about it… My father, GEORGE MICHAEL NAU, USN Honorably Discharged in 1947, Naval Reserve & Civilian Flight Engineer will someday have his day in the sun, above the WALL, above the clouds! Reading this brought back many memories… I was in the Air Force, and stationed at Anderson AFB Guam, and as a Radio operator I volunteered to fly on one of the Base C-54 Search missions for the Flying tiger Connie… Alternated operating one of the HF Radios and manning a Surface Scan station during the flight.. Failure to find anything was very frustrating. My Uncle Ernest Dixon ( my dads brother) was on this flight. It devastated my family, and we wish they could have found survivors or at least received information on what actually happened. My grandmother went to her grave thinking the plane had been hijacked and that he was still alive. Edward Mycue, my uncle Bob Gazzaway was another pilot on this flight. My grandfather went to his grave in the late ’80s, still waiting for his son to show up after a mission he’d described as “secret, and probably long…”.